This item was purchased by Victoria & Albert Museum, London. 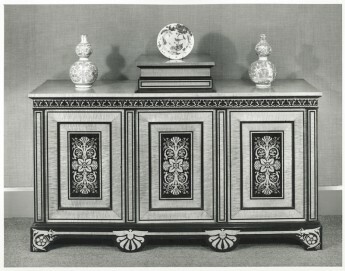 Ebony-inlaid maple side cabinet by George Bullock, the interior containing three banks of shallow drawers for collections. Now in the Victoria & Albert Museum (Mus. No. W.32-1979). The unusual plinth on the top, which does not open, has previously been thought (including by us, when we had it) to be for a sculpture or other decorative object. (1) However, it has recently been suggested by John Hawkins that it was most likely for a glass case containing a stuffed bird, or birds, the drawers of the cabinet being for natural history specimens, such as birds' eggs. The fact that drawers of the cabinet still contain birds' eggs and mounted butterflies and moths(2) makes this supposition even more likely. 1. See Western Furniture, 1350 to the Present Day, ed. Christopher Wilk, 1996, p. 142. 2. See the V. & A website description of the cabinet.